ANNVILLE, PA – Sophomore quarterback Ryan Dailey threw for a career-high 212 yards and three touchdowns on way to being named to the Middle Atlantic Conference weekly honor roll as an honorable mention selection as announced by the conference office late Sunday night. Dailey was efficient under center in just his second career start finishing 8-for-15 with 212 yards and three throwing scores (all in the first half) in Wilkes 41-7 MAC win over local rival Misericordia University. He began his career afternoon with a 13-yard touchdown to Tim Bousson in the first quarter, and then added a six yard pitch-and-catch to Drew Devitt and a 32-yard score to Jeremy Hartman in the second quarter. 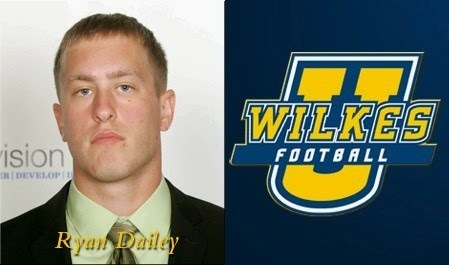 For the season Dailey has thrown for 287 yards on 17-for-32 passing including 143.5 yards per-game. Wilkes returns to MAC play Saturday night traveling to Doylestown, Pa. to face Delaware Valley College at 7:00 p.m.